When choosing which company to engage to carry out your difficult access abseiling work, or work at heights, there are a few things to consider. This is particularly relevant in relation to the specific type of works you are undertaking. For instance, if you are carrying out painting works via rope access painting on a multistorey building, make sure that the rope access personnel you are contracting to do the works are competent, experienced painters. It’s one thing to be able to access hard to reach places, but quality of work is another thing altogether. Always engage in discussions with rope access companies as to what types of painting projects they have undertaken previously and don’t hesitate to ask for references. If the contractor takes pride in their work and has a history of producing good results in the rope access painting field, or any other remedial maintenance work types, they will be more than willing to let you speak with their previous clients and even go onsite to see the type of work quality they can produce. Highrise commercial painting can be undertaken via an array of different means in terms of accessing the facades and other areas of structures at height. Some commercial painters prefer to use large boom lifts whilst others will scaffold a building to undertake works, dependant upon the conditions of the job. An interesting and sometimes very cost effective method of getting access to difficult to paint areas is abseil painting. Multistorey buildings can be painted in their entirety, just by abseiling alone. This is often a very good way to do things, as it means flexible access requirements are easily tackled and it also eliminates much of the cost of getting to difficult to reach places to do painting work. Abseiling personnel should be suitably qualified in industrial rope access and be experienced painters when looking to take on a highrise painting project. 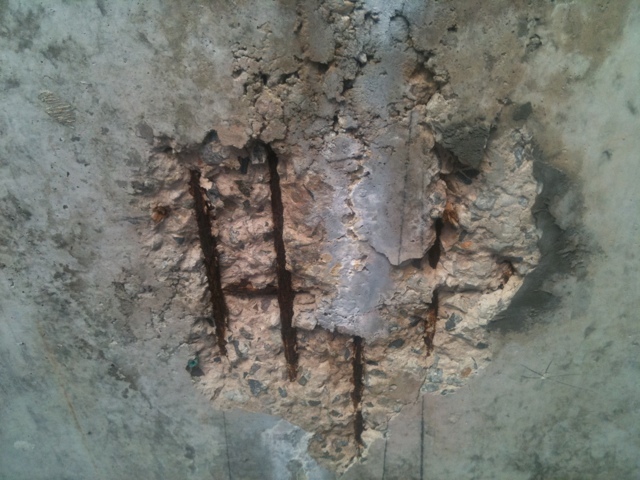 Concrete spalling should be treated as a priority repair. Spalling concrete can be caused by various things, but typically render often delaminates from the substrate & concrete spalls due to rusted reinforcement amongst other things. Difficult access concrete repair is a skilled art. Abseiling and undertaking concrete repair can be the answer in alot of cases where access is either too expensive, or not possible using traditional means. Industrial rope access concrete repair & render repair is the way to go when doing jobs at height. This will minimise the costs of access and maximise the dollar allocation to repairs themselves. Painting by abseiling is sometimes the quickest and easiest way to complete part or all of a painting project which would require various access methods otherwise. Experienced abseil painters should be able to paint as fast as a normal painter, plus of course adding on the time it takes to get back to their next drop point. Abseil painting whether it’s high rise or difficult access can meet your needs for surpisingly low costs when compared to the alternatives. Concrete repair at heights – who should do it? Who should do concrete spalling repairs at height? The answer is not often a simple one. While you can employ a remedial builder who can only reach the area by elevated work platforms or scaffolding, which is sometimes a good option, one thing to consider, is doing the job via abseiling. Industrial rope access professionals are able to undertake all sorts of remedial and maintenance work, including doing heavy duty concrete repair in difficult to reach places. Don’t end up spending heaps of cash renting access equipment, cal lin the rope access concrete repair specialists and get them on the job. Undertaking repair to areas of concrete structures which have concrete cancer is best done as soon as it is identified. This is because concrete cancer has a tendency to spread rapidly. Concrete cancer specialists should be consulted and if necessary, structural engineers engaged, depending on the extent of the problem. Where the concrete cancer is found in difficult to reach places, sometimes serious access equipment is required such as ewp to get to these places. Sometimes scaffolding is required and other times, methods such as abseiling or industrial rope access as it is known. These repairs must be treated with care and only professionals engaged to undertake them. City buildings, often highrise multistorey constructions, can be difficult to undertake maintenance tasks on such as painting an entire facade. While you may think first of scaffolding an entire city building to undertake painting works, this is certainly not the only option, nor the most cost effective. Industrial rope access or abseiling can be the best way to paint alot of structures, particularly those where areas at height need to be accessed. High rise painting can be achieved by descending a building via abseiling and applying paint. The cost of scaffolding alone often exceeds the cost of painting by this method and many asset managers choose to go down the route of industrial rope access painting for this reason. This technique also minimises the disturbance to tenancy, the public and ensures that every dollar spent is a dollar painted, rather than wasted. You should always investigate this access method when looking at large scale painting projects, as it often saves time and money and can be a valuable tool in ensuring a great outcome for your clients. Concrete repair can be undertaken in difficult access situations via abseiling, or industrial rope access techniques as it is widely known throughout the construction industry. To get to difficult access areas of buildings to perform concrete repairs can be an arduous and expensive task. Abseiling is a means to undertake these works in a cost effective way and ensure that the costs associated with performing spalling and concrete cancer repair can be funnelled towards the works themselves, rather than spending massive amounts of money just to get the worker tothe position where he needs to undertake the repairs. Concrete repair is an art and should only be undertaken by competent concrete repair professionals. This is especially important when undertaking repair works that are located at height. Good quality concrete cancer and concrete spalling repairs are achievable when using industrial rope access personnel who have the industry experience to provide high quality outcomes. Our expert team of abseil personnel are in talks with Red Bull Australia discussing how we can produce a new marketing technique delivering a new experience and attention to passers by below. Industrial rope access can be used for various uses from carry out works on the side of the building to marketing launches. If you have any marketing requiring a new edge to grab your customers attention, get in touch with us. In order to reach the difficult to access parts of any structure whilst undertaking painting works, it may be wise to consider utilising abseil painting professionals to do either parts or all of the job. These personnel are trained and licensed to work at heights and undertake various types of work. Abseil painting is referred to within the industry as industrial rope access painting and is one way to reduce the costs associated with difficult access projects. In order to ensure that the personnel you engage are fully trained, they must be able to produce the required documentation to prove they have undergone the necessary training and issuing of nationally accredited competencies in abseiling access. It is also wise to ensure that the abseilers you engage have significant experience in carrying out the type of works you require them to undertake. It’s not as simple as just engaging somebody that does abseil window cleaning to carry out the painting on your job. Make sure you find reputable companies who specifically provide abseil painting services.